Ziggy just to get a ballpark on custom prices. can you give a ballpark on what it would take to duplicate a few MG's pictured here? How much would it take to get the figured Maple pair done, and timeframe? I really like the bubinga pair pictured here, can you give a ballpark on different veneer. 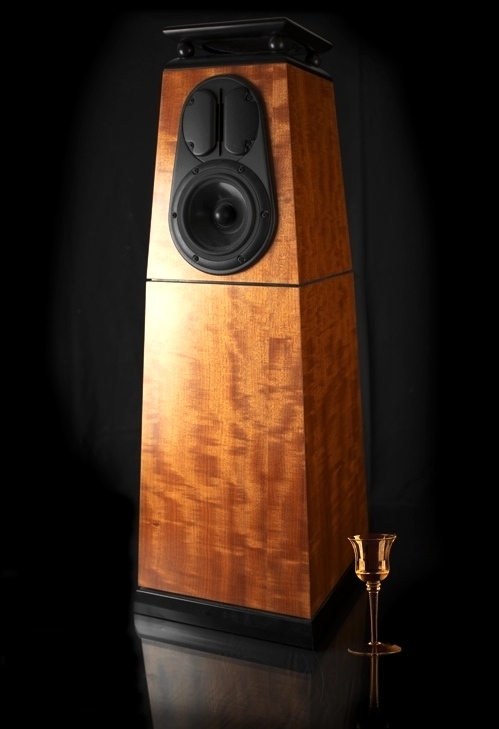 Its pretty simple for most of our speakers, with a custom veneer....here is what we do. Go to tapeease.com look under the 4 X 8 10 mill paper backed veneer and choose the veneer you want, what ever the price of veneer is plus $15 shipping. That is the price of a custom Decware finish. In the case of MG944's, like the pair of Bubinga you mentioned, if I have the veneer here, left over from another job, we can use that. Like right now I have two pieces of heavily figured Birds Eye maple cut and ready to apply to a pair of MG944's and it would cost around $50 more. In a case like the MG944's pictured, there is no since in paying for a whole sheet and only using it on the front and top like we usually do. So again its the price of the sheet that you choose from tapeease.com and around $100. to apply and find the piece of solid wood that matches for the two edges on both sides of the center baffle. As far as time frame goes, next week we are building more MG's so it could be put in with that group, if not it could go the usual 4-6 weeks. And you have to remember that custom is non-returnable.